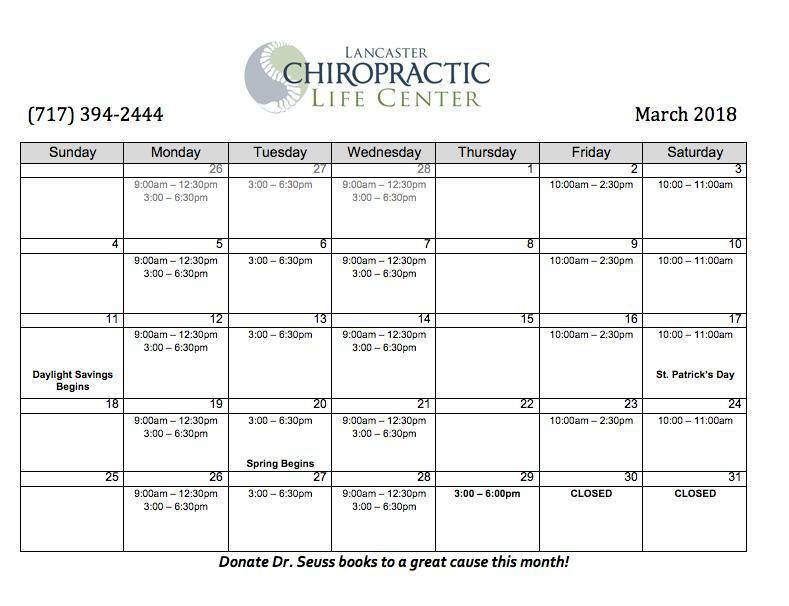 We will be open Thursday, March 29th from 3-6pm. We will be closed Friday, March 30th and Saturday, March 31st. During the month of March, we will be collecting Dr. Seuss books to be donated to the Hamilton Elementary School library in Lancaster City. Please bring in new Dr. Seuss books that may be donated to this great cause! New Patients that bring in a new Dr. Seuss book during this month will receive their 1st Visit at no cost! Why would my baby or child, who has no back pain, benefit from chiropractic care? Chiropractic is not about curing aches and pains; it’s about your life and your health. It’s about having 100% communication from your brain to all parts of the body, thus allowing a fully functioning nervous system. Our nervous system controls and coordinates every aspect of our life. To maximize their child’s brain and nerve function. Enhance their child’s overall health and well-being. To strengthen their immune system and reduce the incidence of colds, flu, ear infections, and other common illnesses. To help with asthma, breathing difficulties, and allergies. To improve a child’s ability to concentrate. To assist with behavioral disorders. To help alleviate bed-wetting and digestive issues. To assist with sleep issues. Whether with or without symptoms, kids receiving regular chiropractic care grow into healthy, thriving adults. When you think about it, our bodies are pretty amazing machines. We can run and jump, see and hear, taste and smell. We are made of many incredible parts that work together to keep body functioning. Considering we are 90% water, it makes you wonder what makes it all work? Just like a car or a computer, our body has a master control center that makes everything work. The Central Nervous System is the complex system of nerve tissues that control the activities of the body. The brain sends and receives messages thru the spinal cord, and nerves to and from the muscles, organs and glands. The autonomic nervous system influences the function of our organs and controls involuntary bodily functions. Think about all the functions we can’t control on our own like heartbeat, food digestion, and body temperature. This system consists of two divisions, the sympathetic nervous system, which is also known as the ‘fight-or-flight’ response. The sympathetic division will increase heart rate and raise blood pressure. The other division is the parasympathetic nervous system. This division slows heart rate, increases intestinal activity and relaxes the sphincter muscles. This system works when the body is at rest. Every system in the body is controlled by the central nervous system. Circulatory system circulates blood and carries oxygen and nutrients. The respiratory system helps us breathe. The immune system must function properly to detect foreign pathogens, such as viruses or bacteria. The digestive system converts our food into energy and fuel. This is just an example of a few systems in the body, there are so many more such as: the endocrine system, the integumentary system, and the musculoskeletal system. All controlled by the nervous system. Messages must travel from the brain down the spinal cord and out the nerves to all muscles, organs and glands. When this communication pathway is clear, the body is functioning properly. If a message doesn’t get to where it needs to, problems arise. If one or more bones of the spine (vertebrae) are out of their proper position then the nerves will not be able to send and receive messages to various parts of the body properly. This disruption of messages is called by chiropractors a Vertebral Subluxation. When left uncorrected, Vertebral Subluxations may result in a myriad of problems. Considering the many bodily systems we spoke of above, think about the interferences that this lack of messages can cause to the various parts of the body. Studies have shown that specific chiropractic adjustments can correct Vertebral Subluxations and may be beneficial to help the body heal many common disorders. Studies have shown adjustments affect diastolic pressure as well as constipation, chronic otitis media and headaches. Chiropractors recognize that your body has an inborn ability to heal itself and are the only healthcare professionals that have been trained in detection and correction of Vertebral Subluxations.